Pursuant to 28 U.SC. § 546, Attorney General of the United States Jefferson B. Sessions III has appointed Mr. Shawn N. Anderson as Interim United States Attorney for the Districts of Guam and the Northern Mariana Islands for the period of one hundred twenty days commencing January 5, 2018, or until a Presidential appointee qualifies under 28 U.S.C. § 541, whichever occurs first. Chief Judge Frances Tydingco-Gatewood ceremonially swore Mr. Anderson in at 9:00 a.m. on Thursday, January 4, 2018. 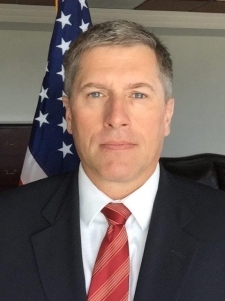 Mr. Anderson has previously held the positions of First Assistant United States Attorney and Criminal Chief for the districts of Guam and the Northern Mariana Islands. Mr. Anderson has served as a federal prosecutor with the Department of Justice since 2003. His tenure has included positions as Branch Office Supervisor in the Eastern District of Washington and Resident Legal Advisor for U.S. Department of Justice Office of Overseas Prosecutorial Development, Assistance, and Training in Baghdad and Karbala, Iraq. Mr. Anderson has extensive trial experience in state and federal courts, including cases involving murder, kidnapping, narcotics, crimes against children, white collar fraud, and theft of trade secrets. He has also reviewed investigations of officer-involved shootings and obtained guilty verdicts in cases involving state and federal law enforcement as victims of violent crime. Mr. Anderson has also trained attorneys and law enforcement in Guam, Saipan, Washington, Oregon, and South Carolina, and overseas in Iraq, Bangladesh, the Marshall Islands, and the Federated States of Micronesia. Mr. Anderson earned his law degree from Willamette University College of Law in Salem, Oregon, and he holds a B.S. in Business Administration and a B.S. in Psychology from Oregon State University.